The Undeposited Funds Account is one of the most useful accounts in QuickBooks®. If used properly it will save you a lot of hair pulling and tears when you come to reconcile your bank account. It is also a useful control tool to monitor the business cash accounts. The Undeposited Funds Account is set up automatically when you first post a payment for a sales invoice or sales receipt. It acts as a holding account until the cash, checks or credit card payments are actually deposited into the bank account. Think of it as the representation of your petty cash tin or safe in QuickBooks®. To make sure that all customer payments are posted to the Undeposited Funds Account you will want to set one of the preferences. This is found at Edit|Preferences|Payments|Tick the “Use Undeposited Funds as a default deposit account”. When you have deposited the customer payments in to the bank account you can enter this deposit in QuickBooks® by going to Banking|Make Deposits. 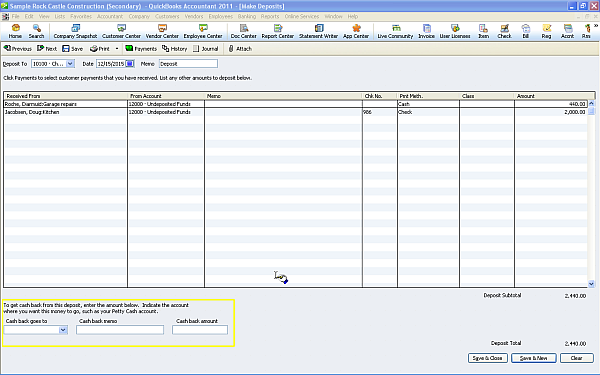 That will bring up the following screen showing all the customer payments that are in the Undeposited Funds Account. Put a tick next to the customer payments you are depositing then click OK. If you held some of the cash back from the deposit the details for this can be entered in the highlighted area above. When you are happy with the deposit click Save & Close and the deposit will be posted to the bank account. If you need help setting up or using your Undeposited Funds Account please call (480) 363-4808. This entry was posted in Accounting Tips and tagged QuickBooks, Undeposited Funds Account. Bookmark the permalink. 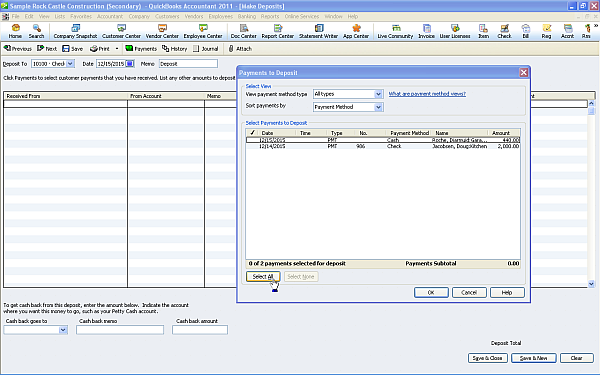 At the beginning of this year we began inputting credit card charges into thru the vendor “enter bill & expenses” section of QuickBooks, however we never used the pay bill section. We simply used the data for expense tracking purposes, the same went for inputting customer invoice; we never deposited the undeposited funds. Recently we did one large fund deposit and one large bill pay but the accounts were off by 20K positive, so we temporally placing that extra income as owners draw. Now we reconcile each month and input credit card charge property, and everything matches great. Here is the catch, before we did that large bill pay and depots the undeposted funds. We forget to input a credit card statement which had many charges totaling 8,000. ( no wonder there was a positive difference ) What do we do with it, how can we input the charges w/out screwing everything up. I would enter the credit card statement that you missed and post a credit on that statement for the balance to owners draw to offset the 20K you have already posted there. The credit card statement will then be a zero statement as you have already effectively paid it with the large bill pay you entered.